The Scorpion uses both the "Pulmonoscorpius" and "Pulminoscorpius spellings in-game, depending on where you look. For the sake of consistency, this wiki uses the Pulmonoscorpius spelling, as this is the way it is spelled in the dossier and the spelling of the real-world counterpart. The Pulmonoscorpius (Pul-mon-oh-skor-pee-us), or simply Scorpion, is one of the creatures in ARK: Survival Evolved. I'm not sure why, but the giant scorpions I've seen on the Island are far more disturbing than most of the dinosaurs. Rather than simply kill its prey, Pulmonoscorpius gigantus injects its victims with a tranquilizing poison, then eats its unconscious prey alive. This subspecies has a large pair of pincers that seem connected to the same toxin sacs as the tail. I've never seen another scorpion that has this adaptation, but I've never seen another scorpion that's larger than I am, either. Trying to tame a monster like Pulmonoscorpius gigantus sounds like a crazy idea, but I suppose the ability to knock out a foe could come in handy. It could certainly make incapacitating some of the Island's other creatures much easier. Pulmonoscorpius will approach anything out of curiosity, but it doesn't like to be touched... This combination causes dinos (wild and tamed) and players that bump into it to cause it to attack virtually everything at any time. Large hitbox(es) doesn't help the easily aggravated nature. An openly hostile or a touched bug will have its claws raised when in melee range. A single scorpion can be ignored, or waited off. Two scorpions will most likely have the second one attack due to getting too close. A group will target the same spot on a given thing, causing extras to home into the now blocked off spot and touching the rest of the dino/player in question, proc'ing agro of any and all scorpions. Pulmonoscorpius is an enormous land scorpion that haunts the island's warmer interior. It has a glossy chitinous exoskeleton and, uniquely, a pair of venom sacs stored within its pincers; between these and the one that makes up its fearsome stinger, the creature can inject other animals with a potent paralytic neurotoxin. It feeds only on decomposed meat, preferably that which its venom has rendered from its tranquilized victims. Unlike that of most other creatures, its blood is green. It lurks in caves around the island, as well as the rocky terrain around the bottom of mountains, though the latter is much less common. This section displays the Pulmonoscorpius's natural colors and regions. For demonstration, the regions below are colored red over an albino Pulmonoscorpius. The colored squares shown underneath each region's description are the colors that the Pulmonoscorpius will randomly spawn with to provide an overall range of its natural color scheme. Hover your cursor over a color to display its name and ID. For example, "cheat SetTargetDinoColor 0 6" would color the Pulmonoscorpius's "plate edges" magenta. Main Attack Tranquilized The target's Torpor will increase by 3x the damage dealt over 10 seconds. This effect stacks. Using the (PC), (PS4), (Xbox One), the Pulmonoscorpius claws or stings the target. The target's Torpor will increase by 3x the damage dealt over 10 seconds. 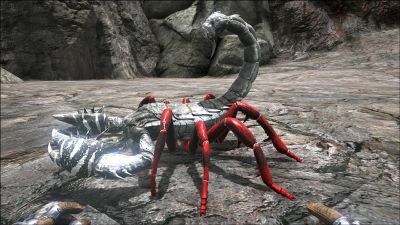 This effects stacks with each hit from a wild Scorpion, however attacks from tamed Scorpions stack up to two times for a maximum of 20 seconds torpor debuff. To knock it unconscious with less of a chance of killing it, use the Slingshot or Tranquilizer Arrows, but try to lengthen your time between shots if you see it doing too much damage. You can also use another scorpion to knock it out. One strategy is to stand upon a large rock or elevation where the scorpion cannot climb up, though finding one may be difficult, as the scorpion can easily climb some rocks. Another method is simply to back away while shooting at it, as it pauses when attacking. A bola will also work to stop it in place. Once it is unconscious, use Narcotics. Narcotics and Spoiled Meat will tame it most effectively, although Narcoberries and Raw Meat also work. Note that you cannot tame it with prime meat. When tamed, they can eat both raw meat and spoiled meat, preferring spoiled. This section describes how to fight against the Pulmonoscorpius. Avoid melee-combat as much as possible; their powerful sting can render a player unconscious (and then dead) very fast. They are easily capable of immobilizing multiple tribe members if not prepared. Their attack deals both torpor and a smaller amount of physical damage. Stay away from their sting and pincers. Due to the slow sprinting speed of a wild Scorpion, it is possible for even a low level player to kill a Scorpion by walking backwards and repeatedly stabbing it in the face with a Spear or Pike. Ranged weapons or a strong mount with high torpor is recommended to avoid getting knocked unconscious. Their attack increases torpor, so it's best to avoid melee combat. Also, don't think you can flee from them by jumping in the water. Scorpions are surprisingly fast swimmers. Their HP is not very high, so attacked with the right equipment / creature, they're easy to knock out or kill. Additionally. the sprinting speed of a wild Scorpion is slower than that of an unburdened player's walking speed with no increases in the Movement Speed stat. Note that when tamed, they are almost as fast as a player's sprinting speed without any increases. Mountain-Climber: One of the best at scaling mountains and difficult terrain. Also capable of defending owner if attacked. Swimmer: Surprisingly adept at swimming along the surface of water. The Swarm: Plentiful, easy to feed, and capable warriors, it is not difficult to amass an army of scorpions. It should be noted that tamed Pulmonoscorpius prefer Spoiled Meat over Raw Meat. Spoiled Meat refills 50 units of food, while Raw Meat only refills 10. Therefore, if players want to save stacks of Raw Meat, they should not put them in the inventory of a hungry scorpion, as it will eat all of it very quickly. To easily get spoiled meat for your scorpion, split your stack of Raw Meat into multiple stacks of one. This will make them spoil all at the same time. The torpor gained from a sting is equal to 3x the damage dealt. 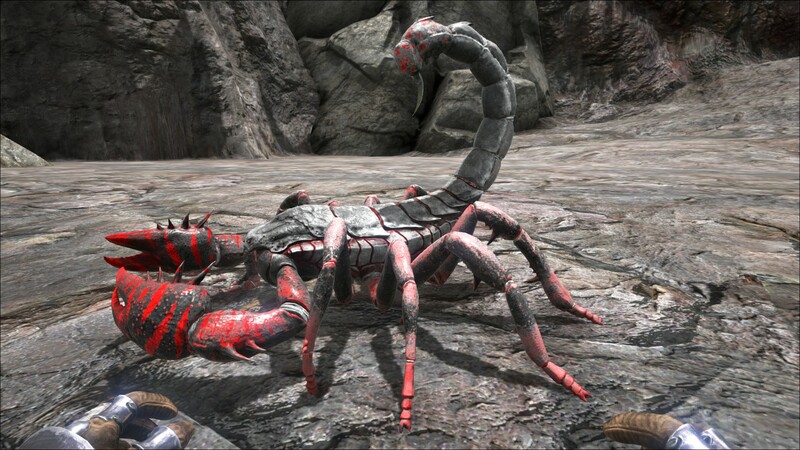 A level 1 Scorpion will have 100% melee damage, dealing 15 damage and therefore 45 torpor. At 200% melee damage, it will deal 30 damage and 90 torpor. Getting your specific scorpion's torpor and damage applied per sting is as simple as multiplying your melee damage % number by 0.45 for torpor and 0.15 for damage. The poison from one sting is applied over a duration of 10 seconds, so stinging in rapid succession will not knock out the target faster. The poison buffs do stack two times. After the first stack has been consumed you can apply a new one, to keep stacks at two. You need to refresh the sting every 10 seconds to deal the least amount of damage and maximum torpor. A mate boosted scorpion will have these numbers increased by 33%. A Scorpion that has 367.9% melee will deal 367.9 x 0.45 = 165.6 torpor over 10 seconds and 367.9 x 0.15 = 55.2 damage instantly. Probably the best terrestrial creature to climb mountains and pass through forests. The scorpion's venom can even knock a Rex unconscious, but it will take time, and the scorpion's health must be upgraded to survive the ordeal. They might be the same species as Brontoscorpio (in real life), which was present in the Silurian, while Pulmonoscorpius is only found in the Carboniferous. Pulmonoscorpius' Melee % directly affects their ability to knock out an opponent. Kibble made with Scorpion egg is used to tame Rex, and scorpions are popular to be tamed for egg farms. The fact that Scorpions lay eggs is scientifically incorrect, as modern scorpions in real life do not lay eggs. If a smaller creature (Dodo, Compy, small raptor etc.) is located behind a tamed scorpion's pincers it will be locked in place and unable to move, despite its best efforts. This is a useful and efficient way to tame fast fleeing dinosaurs such as the Oviraptor and is very accessible as scorpions are an easy low level tame only requiring spoiled meat and narcotics to tame. This strategy can be helpful for increasing egg laying for early level Survivors' tames. It is currently impossible to obtain fertilized Pulmonoscorpius eggs from a tamed pair, as they currently can not mate.